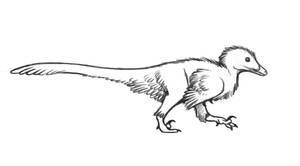 The animal would have been around 4 feet long in life, and its fossil shows that it was covered in feathers -- including, as in its smaller cousin Microraptor, a pair of "leg wings" represented by long paired pennaceous feathers on the metatarsals and tibiotarsus. One of Changyuraptor's most unique features is its voluminous tail feathers, and these feathers constitute the longest of any known non-avian dinosaur, with the most distal retrices reaching around 30 cm in length. Gouache/watercolor paint on A3-size hot-pressed illustration board, approx. 5-6 hours. Have there been any proven colors for this? In Dinosaur Train, it is depicted as being blue, yellow and red. Hi Emily, I'd like to know why you put a tail-fan in Changyuraptor but a paired-retrice tail in Zhenyuanlong. Did it live in forests? I only know that the Gobi Desert was still Desert back then, not of the rest of the continent. If so, they could have perched motionless in trees and dropped on prey. That would be a cool threat in a story about humans back in time. Still, I want them as pets. The area microraptorines inhabited were covered in forests. True, this could have survived in plains though, I am sure. I don't think a Changyuraptor can look better than on this picture here. It's one of those pics where you think "yes, THIS is exactly how it might have looked like back then when it lived". The brown-blue-grey colours also fit nicely. beautifully rendered! Also that's a pretty good time, you're fast as well. Think all or most raptors can glide now! It would be so amazing, to see one of those flying! Great work on the feathers, as always! Wow, love the colors on him! They seem so fitting. By the way, was he four feet long with or without the tail feathers? And is it possible for a raptor even larger than him to be a good glider? Thanks! The exact length of the fossil - from the nosetip to the very end of the tail fan - is measured at being 132 cm in the paper, so that's around 4 feet 4 inches or so in total length, including the tail feathers! I wouldn't say that a larger dromaeosaur being a good glider is impossible, in that I can't think of any definitive evolutionary constraint that would necessarily have prevented it, but I don't think it's terribly likely, either. After all, even Microraptor was probably not an especially competent glider. And thank you greatly for clarifying/answering!!! It's really appreciated! maybe, but that hasn't stopped me from making a fictional (and modern day) flying Microraptorine called a Glaurung. saberrex.deviantart.com/art/Gl… . it's big too; close to the limit of avian flight weight, being condor sized. You're in luck: Glaurung, being condor-sized, isn't necessarily at the limit of avian flight weight: en.wikipedia.org/wiki/Pelagorn… The relevant question is probably less a matter of size alone and more a matter of what other morphological features of microraptorines would have made true powered flight pretty difficult to accomplish (like the lack of a triosseal canal). An animal the size of a condor would have had no trouble gliding with the proper aerodynamic equipment. As I've commented elsewhere, the physical requirements for gliding and powered flight are extraordinarily different in nature. This "four-winged" stuff always confuses me. In modern pigeons, long leg feathers are usually a hindrance to movement and flight. I have trouble seeing how the "traditional" positioning of these leg feathers would work on an extinct animal unless its hip sockets have some weird configurations. In modern pigeons, the leg feathers are selectively bred by humans, so it's no surprise that they'd be more hindrance than help to the pigeon's movement. Evolution, of course, plays to no such pointless ends, which leads me to suspect that, despite their visual similarity, the legwings of Microraptor looked and behaved in a much different manner. We don't yet know with absolute certainty how the animal's legwings were held during gliding, but the "sprawling" model theorized originally has been essentially disproven, not just because of an inflexible hipsocket but on aerodynamic grounds as well. The current thinking is that it glided in some iteration of Chatterjee's "biplane" suggestion, with some possible modification. The facts that the "sprawling" model has been disproven and that pigeons are hindered by those feathers (which often descend down to cover the feet/toes as well) are the main reasons why I find it confusing that numerous artists have used those pigeons as the "model" for how they illustrate these "leg-wings." Those pigeon breeds clearly display the issues that arise from such positioning of those feathers: they're constantly breaking shafts and ruining barbs because they're unable to keep the feathers off the ground or from tangling with their tails/wings. No wild bird dependent on flight (or gliding in this case) would be able to thrive with such damage, and it would likely attract unwanted attention from predators. The "biplane" model makes more sense in an evolutionary way beyond the obvious as well. Many bird species tuck their feet up under their bellies when they fly, herons being one of the most obvious exceptions. The "biplane" positioning of a Microraptor is more in line with developing muscles to bring the feet forward and up than the "sprawling" model that reverses joint evolution towards reptilian positioning. This is all true, but it's important to keep in mind that evolution in the wild doesn't happen in a vacuum. It works much differently from human-mediated artificial selection, which usually acts on the target trait of interest and nothing else (outside of traits involving genes that are linked, as in neotony). But in the wild, natural selection involves a constantly shifting interplay of morphology and behavior, and especially in paleontology the latter element can be almost impossible to detect. A microraptorine with voluminous, pigeon-like legwings may have had a suite of accompanying behavioral traits that dictated exactly how it should carry the legwings, how it should walk, and what things to avoid in order to keep them free of damage. Behavior is shaped by evolution every bit as much as physical anatomy, but a pigeon selected by humans for its legwings would have no such set of evolved instincts. This is one of the many reasons why living birds can never be a perfect analogue for extinct deinonychosaurs: behavior rarely shows up in the fossil record, and when it does it's usually much less subtle. Because domestic birds are bred for artificially-selected traits is exactly why paleo-artists should not be using them as models. But behavior is just as much a response to environment as it is to genetics. A pheasant or hawk or goose will still display the typical behaviors of their species associated with posture, including mating/breeding behaviors, even if they're raised in captivity. However, if they're imprinted on humans/captive living, then they typically will not develop the skills associated with survival instincts related to procuring food or avoiding predation. The reason why a pure-blooded, captive but wild bird ends up with damaged feathers is based primarily on inadequate (cramped or dirty/damp) living conditions. But fully-domesticated birds have other factors hindering their behavior and/or ability to maintain their feathers. Animals that are heavily artificially selected for specific physical traits cannot behave in a manner that is in accordance with possession of those artificially-selected physical traits. Just as dogs bred for short faces (pugs, bulldogs, etc) suffer breathing problems for their distorted anatomy, pigeons and chickens can suffer for their distorted anatomy. And feather-footed pigeons are possessed of distorted anatomy. Fantail pigeons, one of several breeds to possess "leg-wings," are bred to be short-legged and pudgy, leaving most of them unable to fly due to weight/lack of range-of-movement of their wings. They would have trouble walking even without the additional long feathers on their legs and feet. And that's why they shouldn't be used as a reference for leg-feather placement in extinct animals... artificial breeding has distorted both their skeletal structure as well as their plumage. And yet, feather attachment on the feet of these pigeons does give us a sense of the sort of developmental pathways being used to generate feathers in these locations, so it's not out of the question that they looked similar, though certainly not identical. Using these animals as reference is certainly better than drawing legwings on microraptorines that look like like this, which don't really resemble anything living (and which don't, imo, look like structures on a real animal). In any case, I get what you're saying and I don't really disagree. In my first really meticulous illustration of Microraptor that was informed almost entirely by published data, I painstakingly reconstructed the legwings in a way that seemed - both on evolutionary and morphological grounds - most reasonable, and this way was based very loosely on the position of these feathers in fancy pigeons. My logic at the time was that the legwings facing directly backwards, as they're usually reconstructed, would impede the animal's ability to sit, lay down, and stand at certain angles, so they'd need to be held in a different way. Out to the side would make more sense. However, other artists, most notably Matt Martyniuk, have reconstructed the legwings of microraptorines to sort of "fold" in a similar way to regular wings, which could pick them up off the ground for these positions. This is how I've attempted to paint Changyuraptor above, though I don't feel strongly which position is the correct one (and they may not be mutually exclusive). I wrote more about this idea here. Wow, it's so clean. Amazing! I might just have seen my new favorite dromaeosaurid reconstruction. This is really great, it reminds me of Peter Schouten's paintings. That's a nice drawing. This dromaeosaur looks like a pretty bird there. The tail finally looks very similar to that of Archaeopteryx. Great work on this! I was wondering if you'd illustrate this new microraptorine. This is a beautiful representation of "the new kid". Very well done! Beautiful animal. I love your work. I still can't get over how realistic this drawing is, it's almost this changyuraptor has the details of a pheasant, or a duck in a case. It goes to show how much we're getting to understand our prehistoric past and your drawings are the closest window we have to the prehistoric past. 5-6 hours? Damn that's good! Very beautiful, you captured it perfectly! Wonderful, as I said on Facebook: the best Changyuraptor I saw so far! Ok, this is the best depiction of the new taxon I've ever seen ! I knew you would do something beautiful but this is beyond my expectations ! I really love the combination of brown and blue, warm and cold colors. Really impressive once again !